LexJet is now giving you another way to increase the profitability of your printer. 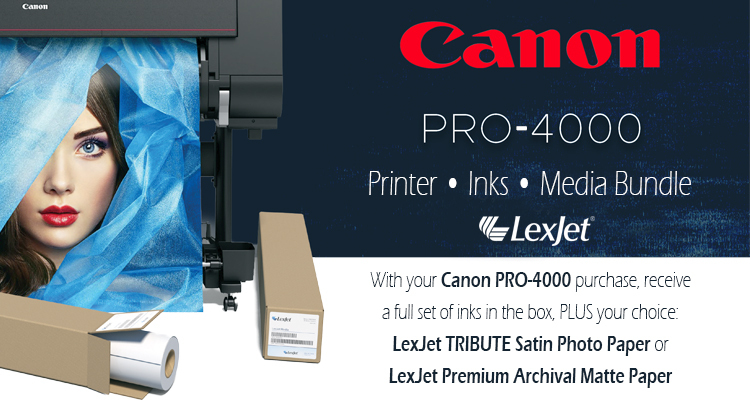 For the remainder of June, when you purchase a Canon PRO-4000, choose a roll of TRIBUTE Satin Photo Paper 240g or Premium Archival Matte (up to 42-inch). TRIBUTE Satin Photo Paper is an instant-dry photo-realistic paper for high-volume print reproductions like posters, displays, and portraits. Premium Archival Matte offers a smooth, matte finish that is perfect for high-quality fine art prints. With a new printer, full set of inks, and a full roll of media, the Canon PRO-4000 will be a profitable addition to your business. If you would like more information on how to improve your printer ROI, contact a LexJet printer specialist at 800-453-9538 today.